If you logged onto Facebook Monday, there's a good chance you noticed a number of friends checking in at Standing Rock, ND — even though you saw them, like, an hour ago. On your couch. So, obviously, they're not in North Dakota — begging the question, What does checking in to Standing Rock on Facebook mean? Based on several posts which went viral early this morning, tons of people across the United States have begun checking in via Facebook at Standing Rock, ND, where protesters have been in an increasingly hostile standoff with police for months. 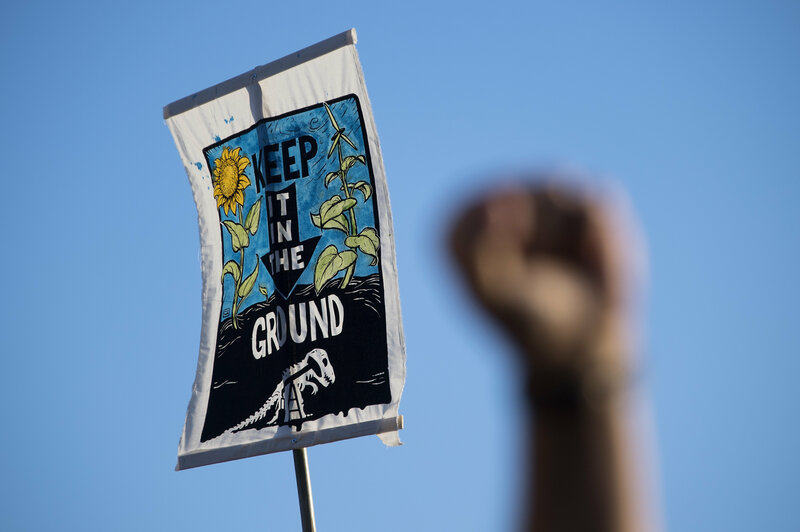 The protests are in response to the creation of the Dakota Access pipeline, which is planned to transport crude oil 1,170 miles from North Dakota to Illinois. Much of the construction has been taking place near the Standing Rock Sioux Reservation, the sixth-largest Native American reservation in the United States. Though the pipeline was presented by Energy Transfer Partners earlier this year as a safer transportation alternative, environmentalists and members of the Standing Rock reservation have pointed out that the Dakota Access Pipeline (DAPL) threatens the region's water supply, as well as sacred and tribal burial grounds. In the Facebook posts, which Standing Rock protesters have yet to claim as their own, the Morton County Sheriff's Department is accused of using Facebook to target protesters; specifically, using the "checking in" feature to suss out the location of prayer camps and break them up. It's worth noting that the Morton County Sheriff's Department has denied these accusations, stating in a Facebook post, "The Morton County Sheriff’s Department is not and does not follow Facebook check-ins for the protest camp or any location. This claim / rumor is absolutely false." As a result of these rumors, supporters of the #NoDAPL movement are being urged to publicly check into Standing Rock Reservation in North Dakota, which is seen as both a sign of solidarity and a way of misleading the Sheriff's department. Additionally, they are asked to mark their status as "Public," and to publish any sort of explanatory or contextual statuses ("I'm not really in Standing Rock, don't worry") in a separate, locked post. Fact-checking resource Snopes has yet to confirm whether checking in at Facebook is actually beneficial to those at Standing Rock. The Morton County Sheriff's office denies using Facebook to target protesters. Protesters are reportedly welcoming the solidarity, but deny posting the statement, though they do note that law enforcement regularly uses social media as a monitoring resource. While any sign of solidarity is important, there's a larger issue at hand: Posting on Facebook does not provide protesters with any actual aid — material, legal, or monetary. Over 140 people have been arrested within the past week, protesters are dealing with increasingly harsh weather conditions, and they are facing down a $3.7 billion construction project. The increase of awareness on social media has not as of yet translated to an increase in actual donations. If you are interested in taking your activism a step further, The Free Thought Project has compiled a list of resources, including donation links, information for sending supplies to protester camps, and who in power has the ability to stop construction of the Dakota Access Pipeline.